Has Mr Glazer finally got his hands on Manchester United? US billionaire Malcolm Glazer has won control of Manchester United, the world's richest football club, after buying a large stake from the club's biggest shareholders, as well as another major stock holder. 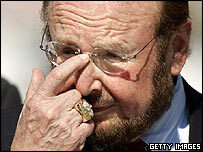 Is there anything that can be done to stop Malcolm Glazer now? Opponents of his takeover of the world's richest football club really have their hands tied. He is now majority shareholder, with a 74.81% holding, and has made a formal offer for the remaining shares. Roy Kaitcer, a director of Brewin Dolphin, stockbrokers for Manchester United, has said those opposed to Mr Glazer can do little to stop him. "Shareholders United (the supporters' group) have got a very small percentage of the shares and, in truth, once you've got over 50% you've got control, and when you've got to 75% and you can get things through the Extraordinary General Meetings and Annual General Meetings, then there's very little that they can do," he said. The American has just secured the 28.7% stake of Irish racing tycoons JP MacManus and John Magnier by paying £227.2m. Red Football Ltd, acting on behalf of Mr Glazer, said the Irishmen had sold their stakes for 300p a share. He later secured the shares of Scottish mining entrepreneur Harry Dobson to take his stake to 62% and then bought more shares to increase his stake to 74.81%. This makes the 76-year-old the largest shareholder in the club and he has now put forward a formal bid for the club, which values it at £790m. There had been a feeling that the Irish pair, who have always been the key to whether Mr Glazer could get hold of Manchester United, would not sell their stake. Three months ago it was reported that they felt the £3-a-share offer undervalued the club. Supporters have also been vocal in asking them not to sell their stake in Manchester United, and were confident their message had got through. The Irish duo, who held a stake through their vehicle Cubic Expression, are thought to have made a £70m profit on their original investment. What has the club's reaction been? The move came two weeks after the Manchester United board said it would not recommend Mr Glazer's takeover proposals to investors because his business plan appeared "aggressive". Mr Glazer had been given a 17 May deadline to submit a formal plan or withdraw his attempts to buy the team. His first two proposals were rejected by the board, which said the package relied too heavily on borrowed money. Manchester United issued a statement on Thursday noting Mr Glazer's announcement and said it was waiting for formal terms of the offer from him to be published. It said: "A further announcement will be made once the board has reviewed that announcement." Why have the club and fans been opposed to the takeover? Manchester United has been a well-run club, which has invested in the Old Trafford Stadium and players without getting itself into debt. Mr Glazer's bid involves borrowing large amounts of money to finance any takeover, although the levels have been cut from the amount of debt he carried in his initial approaches to the club last year. There is a fear now that he will eventually gain such a large shareholding that he can collapse his debt onto the club. Should Mr Glazer increase his holding to 75% or more, then he can rewrite the company's articles - effectively giving him carte blanche to run the company as he wants. Mr Glazer is now just barely short of that 75% level of shares. And if he can get 90% of the remaining shares, he can make a compulsory purchase and scoop up the other 10%. Has Mr Glazer expressed any interest in soccer before? He is the owner of the Tampa Bay Buccaneers American football team. But the pursuit of Manchester United has reportedly been led by his two sons, Avi and Joel. American sports journalists have said they are unaware of his previous love for soccer, with one, Sean Wheelock, saying: "I think he sees this as a way to make money from football". What was the reaction in the world of investors? Shares leapt up to near the £3 mark on news of Mr Glazer's offer and more than a hundred million of the club's shares were traded actively in London. Analyst Sam Detta, of Inner Circle Sports, said he would be interested to see what business plan Mr Glazer had to generate more revenues at Manchester United, as the general feeling was that it was already a "very well-run club". There will have to be a formal offer period set' during which shareholders will indicate whether they accept or reject the offer. However, with the Cubic Expression stake in the bag, Mr Glazer has the majority shareholding whatever happens. Fans' group Shareholders United will be campaigning to prevent him reaching the 75% stake. Institutional shareholders may, on the other hand, see the £3-a-share offer as attractive.